Here at New York Food Journal, we’re dedicated to exploring the best food the Big Apple has to offer: in its restaurants, in its stores and in its home kitchens. We do recognize that great food is made elsewhere, too, so from time to time we will discuss the culinary delights available in other places that New Yorkers may wish to visit. For the first installment of our Beyond the Five Boroughs feature, we’ll be visiting New Orleans, one of the best food cities in the world. This post covers the city’s street foods, snacks, and sandwiches. The next post covers New Orleans’ Cajun and Creole food and the final post is on Chef John Besh’s Restaurant August and Lüke. 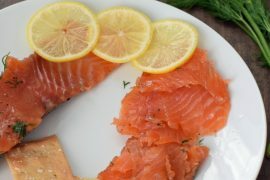 We hope that visitors to this site from outside New York will stay to browse our recipes and consider our restaurant reviews when planning their next trip to New York. New Orleans is a mecca for street food, snacks, and sandwiches. It is hard to find another American city that invented and popularized such a wide variety of distinctive street foods. 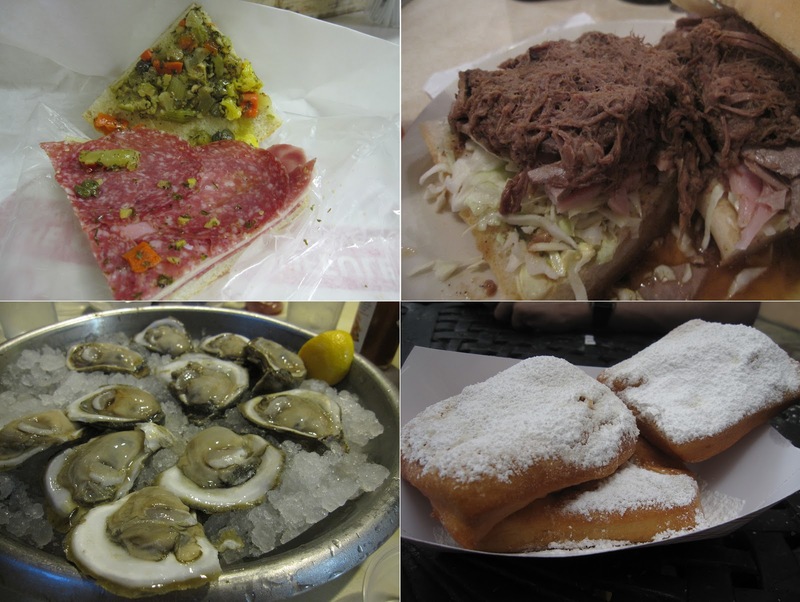 Many of these foods owe themselves to the city’s culturally diverse history — French pralines and beignets with cafe au lait, Italian muffulettas, Irish Channel po’ boys — as well as the city’s proximity to gulf fishing, bringing plentiful oysters and other shellfish. All of these dishes came into being in the early 20th century or earlier: Café du Monde began selling beignets and café au lait in 1862; Central Grocery invented the muffuletta in 1906; the po’ boy was thought to have been invented in 1929, Mother’s has sold “debris” po’ boys since 1938; Felix’s Oyster bar has been selling oysters for over 80 years. A food tour of New Orleans’ street food is both delicious and a look back into the long history of the city. Po’ boys were said to have become popular when during a 1929 streetcar strike, a local restaurant gave free sandwiches to the striking workers — referred to as “poor boys” and then shortened to “po’ boys” by local dialect. These sandwiches are subs, usually but not always served on french bread, and are extremely popular throughout the city. Many po’ boy restaurants have dozens of varieties, but the most popular ones are hot roast beef or fried shellfish (shrimp, oysters, soft shell crabs). Two notable variations can be found at Parasol’s Restaurant & Bar and at Mother’s. Parasol’s is an Irish pub and restaurant in the Irish Channel neighborhood. The front looks like an ordinary Irish pub complete with a long wooden bar and Irish shamrock decorations. Through a door in the back, a sandwich counter and a small number of tables appear. Parasol’s sells around two-dozen varieties of po’ boys. It is most known for its roast beef po’ boy and has long had a rivalry with another Irish po’ boy shop Tracey’s over the sandwich. However, my favorite was actually the fried shrimp. It was the best po’ boy I had in New Orleans. The shrimp were perfectly cooked: tender but not rubbery with a huge amount of flavor. Unlike many fried shrimp dishes from the Northeast, the breading here was light and added a nice crunch. The French bread was also excellent, with a flaky outside and soft inside. The debris was fantastic with great meaty flavor and there’s really no reason to order anything at Mother’s that doesn’t involve debris. Their Ferdi special, named after a loyal customer, has crispy baked ham topped with hot roast beef, with debris on top of that. It’s huge. The ham and the debris were excellent; oddly, the roast beef was ordinary. Some other reviews said the service was bad and unfriendly, but we never had a problem. The famous Muffuletta Sandwich at Central Grocery. Half, at left; quarter, at right. The Muffuletta is also a New Orleans favorite, invented by the owners of Central Grocery in the French Quarter in 1906. This sandwich is a must-try for any visitor of New Orleans. Lines at Central Grocery can easily exceed 30 minutes at prime lunch times — and it is not open for dinner. They must sell hundreds of these every day. All the meats are sliced in store; the sandwich makers work hard! Central Grocery is an interesting place. On first look it does appear to be a grocery, complete with Mediterranean specialties, pastas, spices, and cheeses. But virtually everyone is there for the muffuletta and since there is one line for everything, I can’t imagine someone waiting 30 minutes or more just to buy some dried pasta. The sandwich certainly lives up to the hype. It is made on Sicilian sesame bread, which is an Italian flat bread, similar to focaccia. The bread is filled with layers of Italian meats (salami, Italian ham) and provolone cheese. The key is the olive salad that’s put on top, which combines green and kalamata olives with giardiniera (mixed pickled vegetables). The result is a spicy, briny, mess of a sandwich, but delicious. The sandwich comes in two sizes: a “half” which is the size of a normal sandwich ($7.50), and a “whole” which is twice that and therefore gigantic ($14.50). My one knock on the sandwich is that between the olive salad and the cured meats, it is very salty. But still a must-try sandwich. New Orleans sandwiches aren’t solely historical. A new sandwich shop featuring modern takes on traditional meat-centric sandwiches is also an excellent New Orleans venture. It’s called Cochon Butcher, and is attached to the popular restaurant Cochon. While many of the sandwiches and sides on their menu are worth trying, the pork belly sandwich and the panchetta mac n’ cheese stand out. The pork belly is combined with a cucumber salad with fresh mint to create an excellent combination of flavors, texture, and temperature. It is served on white bread, which may seem anathema to us New York liberals, but is the tradition for barbecue in the South. I appreciated the modern take on traditional pork belly. Oddly, however, the restaurant has a weird infatuation with Kim Jung-Il, the recently deceased leader of North Korea. While waiting for my sandwich, they gave me a flag with Kim Jung-Il’s likeness to place on my table so the waiter knew where to bring my sandwich. And the person who took my order knew an incredible amount of facts about the former leader. Oysters are another staple of New Orleans, and are available at dozens of restaurants around the city. While these bivalves are often an expensive treat in New York City, coming in at or close to $3 each at the best oyster restaurants we have, you can get delicious gulf oysters for around $1 each in New Orleans. The two biggest oyster institutions are Acme and Felix’s — of course they’re both across the street from each other. Felix’s serves oysters many ways: raw, charcoal grilled, rockefeller, or bienville. I’m partial to simple raw oysters but also enjoy the charcoal grilled ones, especially with French bread to dip into the olive-oil/garlic sauce. The char-grilled ones are lightly breaded and retain the smoky flavor of the charcoal. Fresh minced horseradish and bottles of ketchup and hot sauce adorn each table at Felix’s, giving customers the ability to make their own cocktail sauce. This was a nice touch, as many places offer under-horseradished cocktail sauce. Oysters are also served deep fried both on po’ boys and by themselves. At Stanley Restaurant in the French Quarter, they are available for brunch, haphazardly strewn in between two poached eggs prepared Benedict-style. The eggs themselves were perfectly done, and as a long-suffering complainer of poorly executed poached eggs, I was happy. The oysters were good but not special. The waiter couldn’t identify their providence, leading me to speculate that they might have been from a jar; there were no oyster shuckers to be seen in the open-kitchen. Stanley’s did have an excellent bloody mary with pickled string beans instead of celery. Beignets are deep fried French doughnuts and are extremely popular, especially at Café du Monde, a coffee and beignet institution in the French Quarter that regularly sees hour-long waits despite its cavernous interior that appears to have room to seat 100 people. Its beignet mixes and coffee cans are sold at virtually every tourist store in the city. The beignets are crispy, sweet, and cakey doughnuts with plenty of powdered sugar on top. And while the history of DuMonde and its beignet execution are both great, it’s incomprehensible to wait an hour for a table there. The beignets at nearby Café Beignet were just as good and larger than du Monde, without any of the hype or throngs of tourists. And the café au lait at du Monde was downright terrible. It was bitter with virtually no undertaste. You might as well go there if it’s your first time in New Orleans, but wait at the take-out line, where I waited “only” 20 minutes. (They’re also highly inefficient: the same person both took my order and then went into the back to make the coffee and get my beignets, while the person behind me had to wait to place his order). Pralines are another French-influenced dessert popular in New Orleans. The New Orleans variety is soft and creamy, almost like fudge, and is usually filled with chopped nuts like pecans or almonds. Those sold at Southern Candymakers in the French Quarter are particularly good, and you can see them being made by hand as you walk into the store. Excellent write-up for a food tour of NOLA. Did you plan it as a food trip? It seems you definitely did your research. I'm guessing there are upcoming reviews of the finer dining you experienced? Of course, stay tuned for future posts! Loved the article, and it'sflows very well. I love the food, and am thankful it's less than an hour's drive for me. Here's a hint for people coming into the city. Some of the street names in New Orleans sound nothing like they are spelled. A perfect example is Calliope Street. It is pronounced "Cal-E-ope", not the horse drawn musical organ. Second, do not ask for "Pray-leens". That is incorrect. Instead, ask for "Prah-leans". We do not have Crayfish, it's Crawfish. Be sure to visit neighboring Jefferson Parish and make a trip to Haydel's Bakery in the Jefferson if you want a King Cake, which is now sold year round. The best charbroiled oysters are at Drago's. They invented them and there should be no crust on a charbroiled oyster. They have locations in the suburbs in Metairie and at the Hilton New Orleans Riverside.